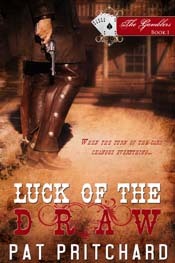 The only woman Cal Preston has ever found worth courting is Lady Luck herself. She's definitely on his side the night a game of poker comes down to one hand, and Cal walks away with all the money and the deed to a young rancher's land. But when the fickle lady immediately deserts him, Cal finds himself bruised up and broke with only the half interest in a ranch between him and disaster. Every day is a struggle for widow Lily McCord as she strives to save her family home. When her young brother-in-law gambles away his half of the ranch, she finds herself in partnership with a handsome gambler. Lily ends up fighting to protect both her ranch and her heart from her growing attraction to a man who has no intention of sticking around. But when Lily and her ranch come under attack, Cal rides to her rescue. In saving Lily, he finds himself gambling with the one thing he can't afford to lose-his heart. The pair of ladies in front of Cal promised to make the evening worthwhile. He didn't smile or acknowledge their presence in any way, but that didn't mean he failed to appreciate their appearance. On the contrary, together they could make his efforts finally pay off in a big way. He tossed two of their companions down on the table. "I'll take two." The dealer slid two more cards in his direction. With years of practice, Cal hid his pleasure at seeing that another of the ladies had decided to pay him a visit and had brought along a second ten to match the one he already had. A full house should be enough to capture the sizable pot that was piling up in the center of the table. It had been a long time since the best cards had seen fit to come his way. He and his friend were just this side of going hungry. Even one good night at the tables could make a difference in their fortunes. But now was not the time to be counting money he hadn't yet won. From the frown on his face, the cowhand was wondering how far the cards he held would carry him. Finally, with a look of disgust, he tossed his hand facedown on the table and stood up. "I'm going to quit while I have enough money to buy me a bottle." He picked up his remaining few chips and headed for the bar. Cal always admired a man who had the sense to walk away when Lady Luck wasn't with him for the night. He glanced around the table. There weren't as many players now as there were an hour ago. He fully expected most of the rest to quit sometime soon. The cards weren't being generous tonight. Only Cal and the dark-eyed youngster sitting across from him had consistently won more than they lost. Eventually, it would come down to the two of them testing their luck to see who the gods were favoring for the night. Cal raised the bet. Just as he'd expected, of the three remaining players, only the one held onto his cards and met the bet. Then he raised it again himself. Interesting. Cal looked at the three ladies again. They were definitely women of expensive tastes. To keep them happy, he would have to be willing to spend a fair amount of money. He reached for his chips. He hesitated long enough to make his one remaining opponent look up. "Raise you a hundred." For a fraction of a second, the stranger seemed to pale, but then he tossed in his last chips without a word. It was enough to raise the cost of staying in yet again. Was Lady Luck flirting with them both? Cal was feeling damn good about his cards. Besides, if he doubted the ladies, they could very well take it as an insult and turn on him. He didn't think of himself as superstitious, just cautious. He tossed out his chips, adding a few to keep the game interesting. His opponent looked disappointed, but determined. Cal knew what it felt like to be backed into a corner, where the difference between eating and going hungry was in the turn of a card. Understanding the man didn't translate as sympathy. On the contrary, that little slip in letting his true feelings show through made it that much easier to come away the victor. The youngster reached inside his jacket pocket and drew out a few bills folded together. He stared at the money for a few seconds and then signaled the dealer to change them for chips. It took ammunition to continue the fight for control of the table. That done, he met Cal's bet and once again raised the ante. A small crowd was starting to gather around the table as word spread that the two of them were playing a high-stakes game. The men who surrounded the game spoke in hushed voices, well aware that the two players wouldn't appreciate any distractions. Cal made a point of ignoring his own dwindling stack of chips. If things went on like this for much longer, he could very well end up sleeping in a field somewhere. It wouldn't be the first time, but he'd grown fond of clean sheets and quality hotels. He tossed in enough chips to meet the bet and then, after only the slightest of hesitations, added a few more for good measure. The crowd was several people deep now, blocking out the noise from the rest of the saloon. The world had narrowed down to the few feet of table between them. "I seem to be a bit short." The stranger held onto his cards, though. "I assume you'd accept my signed promise for the rest." His voice cracked a bit, causing a few folks to snicker. Cal ignored both the boy's nervousness and the spectators' bad manners while he considered the risks. The winnings already on the table would hold him and Toby for a good while even if the man failed to pay off the debt. He nodded and watched the man scribble a note on the back of a piece of paper he'd pulled out of his pocket. He tossed it onto the pile in the middle of the table. Cal spread out his cards on the table, revealing his three lovely ladies and the two tens. The other man neatly laid down his own-a straight, jack high. With a surprising amount of dignity for one so young, he stood up and offered his hand to Cal. "It has been a pleasure, sir." Without a backward glance, he walked away, the crowd parting before him as he disappeared into the night. While the crowd dispersed, Cal took care of the business of scooping up his winnings and exchanging the chips for cash. He considered it bad luck to count his winnings while still in the saloon, so he tucked the money into his wallet and the paper into his shirt pocket. He tossed the dealer a tip, bought himself a good cigar and a drink. He knew he should head directly for the stable where Toby was waiting for him. Instead, he leaned against the bar and took a deep draw off the cigar, pleased with himself and the world in general. Lady Luck was fickle, to be sure, but when she chose you for her partner, life was good.